My ebook ???? ?Made in Birmingham: The Poems??? is a collection of approximately seventy poems. One was called ?? ?Doing Poetry: No Sweat????? I?? ?m going to be a poet. and cut down on food. It isn?? ?t autobiographical, just a poem. There is no garret; I don?? ?t eat to excess but that is a health thing not a starving poet thing; and a distant woman to impossibly love is definitely off the agenda (unless you count Agent Lisbon from ?? ?The Mentalist?? ?, or the very nice female detective from ?? ?Law and Order Special Victims Unit, or the woman detective from ???Castle?? ?, or Ziva from ???NCIS??? ?????. Do I detect a trend here..??).???? In an earlier posting I talked about planning. Each year I have a set of loosely-sketched intentions. For? ?the near future? ?these include ?? ?Having a bit of a push on poetry???. This is a broad statement of intent, but I have several elements in mind that might add up to ?? ?a bit of a push???. I also have a specific image when I talk about ???poetry??? : Not poems that pour out of me, like it or not, but poetry to order, poetry on demand, poetry to a schedule. Poems written in response to the Royal Academy?? ?s ?? ?Sensing Spaces??? exhibition?? Writing in relation to the art exhibition ?? ?Metropolis: Reflections on the modern city???. This exhibition, 23 March ??? 23 June 2013 at Birmingham Museum & Art gallery, is billed as a major showcase of international contemporary artwork focused on interpretations reflecting modern city life. At the time of the exhibition I was exploring (a) cities (b) contemporary art (c) writing. It seemed natural therefore to bring these three together by inventing a role for myself as Writer in relation to the Metropolis exhibition. This involved thinking about what ?? ?writer in relation to ???.??? might mean and committed me to several visits to the exhibition, participation in guided talks about the artworks, taking notes on each work and extending these with further thinking or research. The commitment was to produce up to? ?twelve relatively substantial pieces of writing stimulated by the exhibition. These are being put on this site as first drafts, by the end of July 2013. Three short pieces based on dreams of visits to cities. I often dream of cities?? A young bureaucrat is asked to write a report on the likely future situation re homelessness in Moscow. But it is 1991 and the system is in transition, making it difficult to know what is acceptable. Genocide, Suicide or Neglect: The death of Russia’s metropolitan poor?? Riots have broken out at estates on the outskirts of Paris and a young journalist interviews two young women to get their views on what life is like for them. A piece of paper found in a book prompts a young woman to explore her city’s public spaces, with unexpected results. A child’s dream of city life becomes a reality for him. When Outside becomes forbidden, citizens have to live their lives online, safe indoors – but Outside will always exert an influence. An exploration of what I meant by ‘writer in relation to’. ‘Writing in relation to’ : Means what, exactly? An exploration of the language used in the exhibition, how that relates to the language used in studies of modern cities and whether any conclusions can be drawn from that. This writing arose as part of Birmingham Book Festival 2012. One organised event was for a small group (of writers/readers) to spend one Sunday touring Birmingham ‘as if it were New York’ – trying to see the familiar features, cultures,? ?roads, areas in terms of features,cultures, roads, areas of New York: helped by a briefing before the walking tour started. Behind that was also the idea of the great Americam roadtrip that had? ?given rise to a range of classic writings.
? ?Extend the same material into a second story. This would probably have some text in common with the first story (because of the common source) but should be able to be read in its own right. As it was it turned out to be a sequel of sorts. The background to what follows is a fictional account of a visitor?? ?s encounter with some of Vancouver?? ?s extensive public art and fascinating architecture. Later, back home, sifting through photographs, replaying memories and trying to get beyond the surfaces that person recorded the following which is put here for interest in the belief that sensemaking and storytelling are basic human attributes. I loved Vancouver. The word that kept coming to me whilst I was there was ???nice???. Within that overall blanket of ???niceness??? I captured (an interesting concept in itself) a wide range of images. Now, back home (another interesting concept) I have gone through a process of elimination that involved sorting the pictures into three piles according to the degree of connectedness, for me, between the image and my feelings whilst in Vancouver (as far as I can recall them this long after the event). The ones in the ?? ?most connected??? pile were saved, together with the borderline cases from the middle group. The rest were put to one side. This gave me thirty photos, with which I repeated the process, justifying each choice to myself. Those thirty were spread out in front of me and, again trying to articulate to myself any rationale, I chose my top most relevant one, my second most relevant one and so on until I had just a handful in front of me. These weren?? ?t necessarily the ???best??? pictures of the lot, or even the most ???interesting??? ones. They were the ones that triggered most reflections of my ideas and ramblings whilst over in Vancouver. 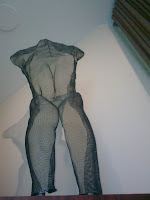 Body sculpture: This sculpture was in the lobby of the wonderful hotel I stayed in. The Listel. It was on Robson, the main downtown street so was handy for all the things I had already decided to do, but the main reason for picking it was that it billed itself as an Art Hotel and, true to its word, was full of original paintings and sculptures. Just walking round the corridors was a great experience. This sculpture was one of several things that I went back to each morning. I would simply sit and look at it for ages, finding more and more things of interest each time. What kind of things occurred to me on those relaxed observations? Clearly it was a body-part: a torso without arms or feet, and missing the head. So, from one angle, it was a part of a crime scene ??? a thing that demanded its own history of how it ended up like that ??? and encouraged speculation of how a detective would work backwards from a discovery of such a body to work out the detailed chain of events that led up to its gruesome discovery by someone. Admittedly this representational, sculptural version wasn?? ?t gruesome (no blood, no gore) but its discovery, tucked away in a corner of the hotel lobby, was still a shock, an unexpectedness, a fascination, a wish-to-know-more. Tucked away in its corner the piece was, in one way, easy to overlook but, at the same time, was set up on a ledge so was itself doing the overseeing??? a shadow peeking out over each new guest. It kept up its solitary vigil as the flow of transients came and went. It might as well have been some remnant of a former receptionist clinging on to the role from a ghostly perch on high. Or some attempt at capturing a Spirit of hotel-keeping, a lighter version of those more solid Greek and Roman antiquities, a reminder that coming and going was nothing in the faceless gaze of an everlasting deity. The dominant thing about the piece was its transparency, the net effect of the latticework; and yet the whole thing had its own solidity ??? solid enough to cast a shadow. An ambiguity in itself: that stuff of such substance could be constructed out of openness. Watching the changing light play in and out of the mesh, there was form and shape and substance whilst retaining its sense of emptiness, of being and not-being at the same time: of being and nothingness. Existing yet not existing; real yet not real. The very emptiness of its net structure creates something new, something with its own existence ??? the diffraction patterns that shifted and swirled as the viewer shifted position. Something out of nothing. The corner it overlooked was the small half-hidden part of the lobby that held the public internet terminal ??? itself a thing that only made sense as a portal to the invisible, without which it became merely a dusty desk and silent terminal. The web/net sculpture held a place of guardianship to the web/net escape-hatch used by the transients to reconnect with the realities they had left behind. Like the terminal the sculpture was a communication route ??? sans mouth, sans hands, but not quite sans everything. Far from dead; far from dumb; far from lifeless ??? but still a lifeless form, dead until interacted with, dumb until communicated with. There was a tinge of Zen about the whole thing. We spent a long time communicating ??? me looking intently at the piece, and the piece (in its own, rather mysterious way) feeding thoughts back at me. 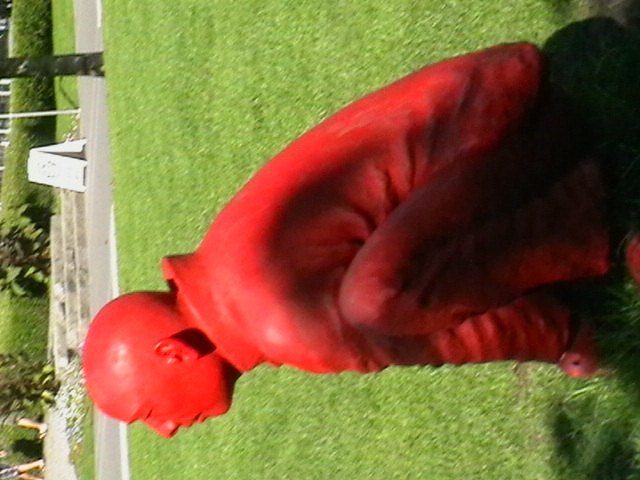 Red squatting man: Turn left from the hotel, zigzag down to the seawall, follow the walkway round the harbour and suddenly you might happen to come across a circle of men squatting on the grass. They seem animated, chatting across their circle. They have a full set of arms and legs ??? so no crime scene: this is everyday normality ??? men passing the time of day, telling each other stories that are more or less true, more or less elaborations on a reality in their heads, more or less absolute fictions. You might end up being transfixed there forever as one more member of the smiling silent circle. In the photograph there is just one man looking off into the distance. 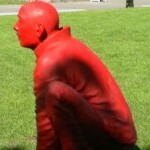 He squats like a frog as if he might at any second spring off, yet there he remains, unmoving and unmovable. The shot misses the fact that he is one of a group of silent squatters, eyeing each other up with looks that are not expressionless but enigmatic. The collective has been reduced to a singularity and this changes everything. He (It looks like a He) is alone, looking out; resting or ready for a race? There is a feeling of boldness, of power, of benign tension. 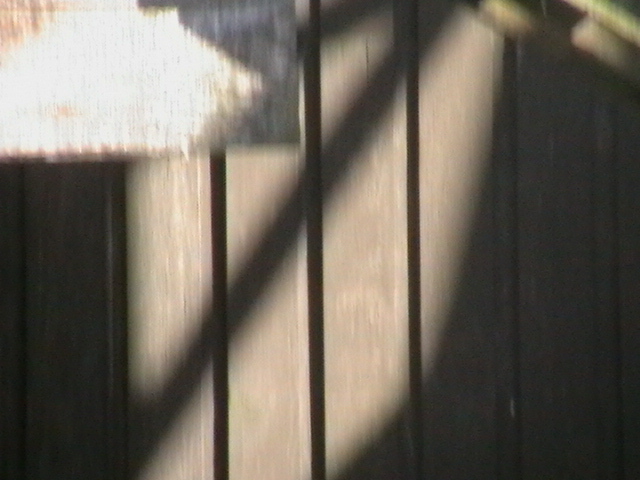 In this particular shot, at that particular time (but shifting as the day goes on or the angle changes) there is a shadow (looming over the man; casting a shade for him to rest in or casting a shadow over his existence?) and a distant pathway and sign (an indication that others may come and go in the near distance but his gaze will not falter; he will remain intent on what is in his head). I sat as one of the group in silent meditation. I felt their tangible presence. I shifted position and sat directly opposite this one man, staring into his look, daring him to change his expression. I lost myself momentarily and became one of them. I snapped back and became one of me. One link to Vancouver that this image held out for me was the sense of the surprise of the everyday. There was a childlike excitement at seeing the first floatplane come in to land on the placid stretch of water. I wanted to tell everyone ?? ?Guess what I?? ?ve just seen ?????? but of course to them it was an everyday thing. Another link was as a representation of the strong community that had resettled from the west, coming across the Pacific: again a surprise to me intuitive Eurocentric fixed view of the world that the way to Vancouver was from the West. Beyond that was the way, common to other places, that this rooted community became the historical site of what was now a tourist, heritage part of the city ??? with the warning that the vibrancy of neighbourhoods can easily tip into nostalgic aspic: Circles of old men animatedly gossiping being replaced by casts circles of statues frozen in the act. 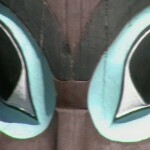 Totemic eyes: This picture was taken at one of the landmark places in Vancouver: the totem poles in Stanley Park. This itself threw up for me a host of things to think about. Stanley Park: An English park; a legacy from the British colonial governor Lord Stanley; with its Rose Garden and so on ??? as one stop on the tourist trolley bus route, as a place savoured by residents and tourists alike for the Sunday walk, the routine rituals of open-air exercise and relaxation. Yet, there as one of the focal points, harbouring in one of its leafy clearings, a collection of totem poles. Totems; iconic symbols of heritage but of otherness; markers of histories and territories; carriers of stories and myths intertwined so that one reality bolsters another. Reminders that the locality was a site of struggle with nature, a site of daily routine for survival as well as a not-so-long-ago site for community joys and sorrows. The poles carried meanings within their original communities. Here, clustered together, huddling for strength or standing as proudly independent as they can of the surroundings they now find themselves in, the poles carry sets of cultural meanings that have been shifted in time. The meanings were always mediated versions but now also carry overlays of what the modern tourist viewer brings to it all. Meanings are whatever we ascribe to the context. Are the poles meant as education, or as a parading of history before photograph-hungry visitors (and remember ??? I felt compelled to get my own shot of them: and a shot that didn?? ?t even wonder if the eyes were those of a beaver or a bear or whatever, just a shot attracted by the eyes because of the electric blue colouring). 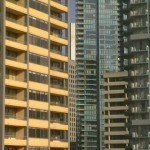 Whatever they are intended to be they are very popular, very iconic of Vancouver as it is now ??? whatever they may have been in the past or in other settings. The eyes are the gateway to the soul. 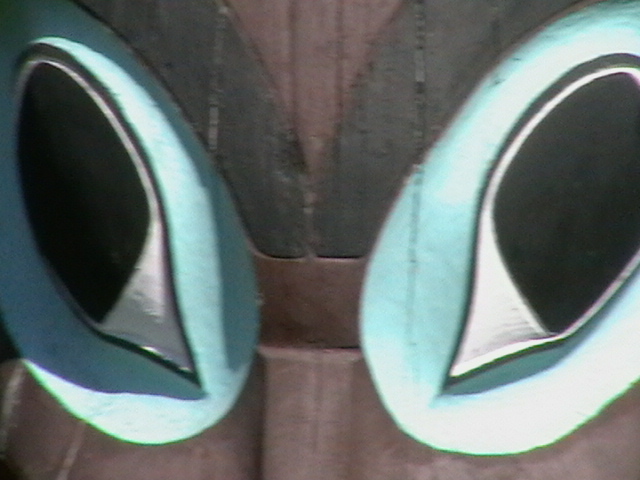 The eyes on the totems were transfixing as if the past wanted to hold me in its gaze and assess me as fit (or not) to stand on those traditional lands. There were eyes everywhere, culled from different places, different communities: relocated to stare out somewhat defiantly ??? challenging me to come to terms with a different history, a different way of interpreting the world, a different sense of humanity. I felt small in their presence. This particular set of eyes I found to be the most powerful. Others seemed to look mockingly, or accusingly. These eyes seemed to hold some compassion. I found them hypnotic. With the sun on my back we looked into each other?? ?s gaze for as long as one of us could bear it. The eyes dominated what I saw. It is only when I look at the picture that I see the background detail, the patterning of the wood, and so on. Tower blocks: Actually that is probably a wrong title ??? very English, very denigrating. There is a whole set of popular and academic studies done on estates, high-rise living, ideologies and community. The phrase ?? ?tower blocks??? has negative connotations because of these. But these blocks were strangely attractive. Maybe the better title would be ?? 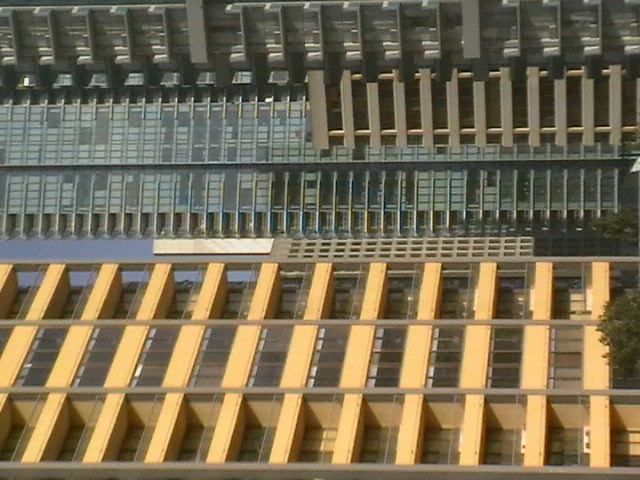 ?Apartment blocks???. But, even so, it?? ?s not about the blocks but about the spaces between them ??? the gaps in which one might catch a glimpse of something else, something beyond the sides and edges of the colourful facades. In the case of Vancouver there were the almost secret flashes of sea and sky and mountain beyond the reflecting angular geometry of its urban front. It is about seeing the gaps (what is almost not there) rather than focusing on the obvious. It is about looking in hope, beyond the normal visibility: things partially screened, partly hidden, almost secret. Things that can only be seen at an angle. I asked about prices, about affordability, and about who therefore might live in such places (with their securely purchased views of water, of hills ???) and who might be relegated to other shabbier dwellings over on Eastside (and whether that means insecure, rented views of semidereliction). Is this image emblematic of Vancouver ??? the view that people take with them when they leave the city ??? or is it representative of the city to those who regard themselves as citizens? The image has its own beauty ??? blocks of colour, modernist shapes, repeated angles. 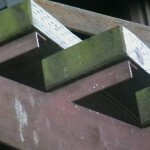 Shapes and segments, when one takes the longer view, when one sees in passing ??? but each segment, on closer inspection, when one stops to see, is a home. Each box is a site for daily decisions. People are structured together, boxed in but barely interacting, with each life customised into private individualism. Each apartment is a box within a block; each block is a square on a grid of streets; that arrange to form recognisable zones ??? and so on ??? and each on its own timescale. The apartments get changed round, redecorated, refurnished on a rough annual cycle, on street layouts that keep changing as cities reinvent their arteries, their flows, their internal logics to neighbourhoods that get described in guidebooks as emerging more slowly, over decades ??? neighbourhoods that can be experienced immediately as you move around the city but also which are measured out in centuries as the heritage of an unfolding, ever-expanding city like Vancouver. I wandered round most of them: Gas Town, Yaletown, Granville, Davie, Chinatown, Downtown, even venturing out onto the beginnings of East Hastings. Areas that were all neatly delineated on the tourist map, all segregated onto their own page of the guidebook. Each having its own personality: the spirit of the area. Each seemingly having its own purpose in the daily workings of the city; its own meanings for the people who live and work there ??? and different ones for people like me, meandering through as tourists. Were there always different ways of experiencing the same physical spaces: the lifeviews of residents and the passing views of visitors; the perceptions of settled communities and of newcomers; of First Nations and of latecomers; of City Hall officials and of street-dwellers; of police officers and of career villains? Worlds that overlap and collide and co-exist and coalesce into a shimmering vibrancy that is Vancouver. Fence: I spent a long time watching the change of light and shadow on this background before eventually deciding to take one shot as a representative of the whole process that probably deserved more ??? a film maybe, to capture its richness ??? but had to settle for this single shutter-click. After all a film would only have been able to capture the one bit of transience out of the whole day, or what would have been recordable yesterday or the next day, in different weather. Each recording, however long or short, would have been a fragment of the totality; one of the millions of possible variations of the same reality. Whatever we record, write, think, do, attempt is a mere fragment of what might be written, thought, done, attempted. Life turns out to be merely one version of a myriad of potentials. At the same time this image was uniquely the one I had before me at the time. It was all I had. I was being fascinated by this one not by any imagined others. I focused on the detail in front of me. The lines; the edges; the transitions from light to shade and back again; the patches of light in the shade and patches of shadow in the light; the hard fixed lines of the wooden slats interplaying with the fuzzier shifting lines of shadow; the straights and the arcs; the ambiguities of it all. When I stopped watching I realised that I had spent more than an hour there: Amazing how long you can spend watching a line of light move across a background. Steps? : The only reason why this kept getting through the selections was that I have absolutely no memory of taking it ??? yet I must have done, There it is on the memory of my camera, sandwiched between a shot of the Steam Clock on Water Street and a shot taken the next day of a strange little statue of Emily Carr. I remember sitting in the Starbucks next to the steam clock, inside and warm whilst a knot of Japanese waited in the drizzle to take a photo of the clock as it went into its steam-driven Westminster chimes. A quarter of an hour later the sun was out (such is the changeability of Vancouver?? ?s many microclimates) that I was able to get a shot of steam and clock without others cluttering up the scene. I remember the walk over and down to the jetty and the bobbling little boat across to Granville Island. I wandered round the place and then got a bit disoriented trying to find a way back up to the bridge to start the short trek back to the hotel. It was then that I came across this statue of a woman, a donkey and a monkey (tucked on a corner just off Granville). The plaque explained all. I remember stopping, reading. I remember Starbucks and the clock. I remember the bobbling boat and the loaded fruit stalls. I remember the weather, the seagulls, the flyover, the traffic. I remember everything: So why have I no memory of taking this shot? I am not even sure what it is. 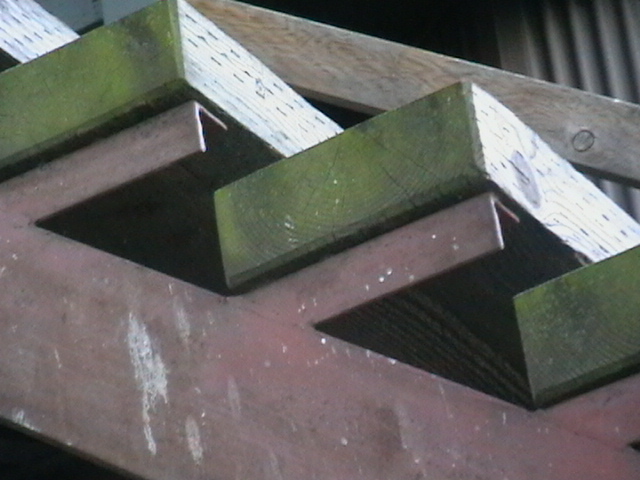 It could be steps, or shelves, or balconies. It could be a picture of things high up, from below ??? or maybe that is some illusion. There are diagonals; there is repetition; there are lines of light, blocks of darkness, hints of colour and pattern to break the monotony. I can see all that but still have no memory of taking it. Strange. I read somewhere recently that our idea of memory has changed. It used to be that memories were stored, each in its separate box. Pigeon holed, to be revisited as a whole unity. my image is of a huge warehouse full of cardboard evidence boxes all labelled and filed, and some old half-forgotten guardian as the only one who remembers the somewhat idiosyncratic indexing system. A ???lost??? memory is then a box not put back in the right place with the possibility of it being stumbled upon surprisingly, having slipped down behind other boxes ??? open the lid and there is the whole memory readily back in place. The current view is more complicated: Each memory has to be reconstructed (from fragments stored in distributed form across the brain) each time it is called to mind. It is a wonder, on this model, that more memories aren?? ?t reconstructed differently (But how would we know? Each memory would feel that it is the right one, having no other memory to compare it to ??? we could end up living a life based on thousands of badly-constructed false memories ???) or that links get broken and it becomes impossible to put that memory together in that specific way (But the fragments are still there, itching to be constructed into something ??? maybe a sense of a memory that doesn?? ?t fully appear ??? a deja-vu ..). Whatever the cause I find it incredulous that I have the tangible evidence of having done something that my brain has no memory of me having done. Scary. Looking at the set of pictures spread in front of me I am struck by several ideas. These images are significant things; things that are heavy with meaning for me. They each relate to some reality out there on the streets of Vancouver but here, back home, out of context, they are abstracted things. They seem things I have grabbed, to hold onto, to mull over, to make something of them, to pore over and maybe read more into them than they deserve as they begin to take on meanings of their own. The pictures are symbols, totems, reference points to be gone back to over and over again (particularly if a person feels that they are losing their way). They become a mix of imaginations and remembrances, and when the time has passed they become assurances that things must surely have happened ??? because there is always a? ?photo in the album. This light murder mystery is set around Birmingham?? ?s famous Outer Circle number 11 bus route. When bus drivers start to be killed, passenger Gail decides to get to the bottom of it all. Almost seventy short fictional tales as told by a wide variety of characters. The tales demonstrate a broad range of personalities and viewpoints. This collection of poems was drawn together to cover a wide range of lengths and styles and to appeal to a broad variety of readers. Some are meant to be taken lightly and others are meant to be lingered over. Sam, for reasons that cannot be divulged here, is contained in a box ??? alone with his thoughts, memories and imaginings. Will he escape ???.? Read to find out. 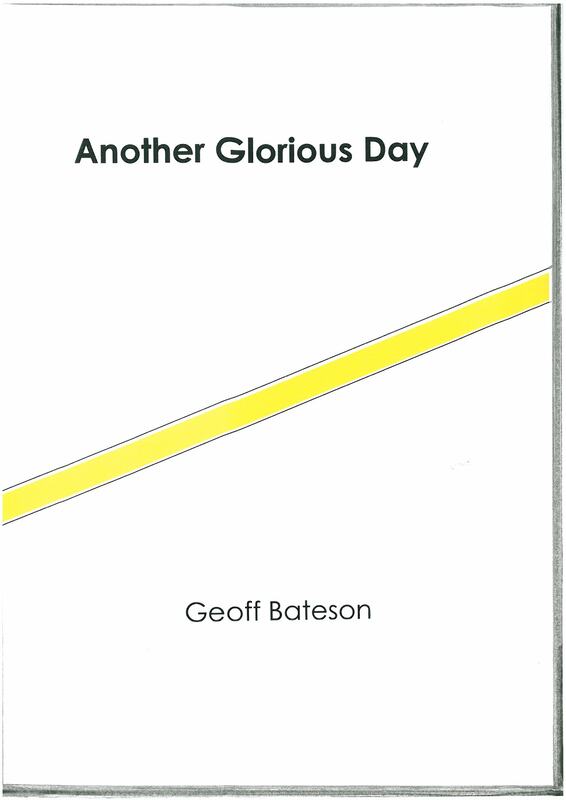 Visit ‘Geoff Bateson’ at the kindle bookstore on www.amazon.co.uk or www.amazon.com. The books are also available on the German, French, Spanish,? ?Italian, Canadian, Australian,? ?Dutch, Japanese, Indian,? ?and Mexican versions of Amazon. As Birmingham?? ?s contribution England?? ?s national Year of Reading a number of very short fictional ???tales??? were written especially to help promote reading to new readers. These were intended to be distributed as widely as possible to people in Birmingham and beyond. These writings were produced essentially for an adult audience, but have general appeal within that. These are (fictional) stories told to an imaginary researcher. They capture fragments of the lives of each narrator, told from their own unique perspective. The ???tales??? are also being brought together as an imagined account of social research under the ?? ?Sides and Edges??? heading. A selection is offered here as a taster. 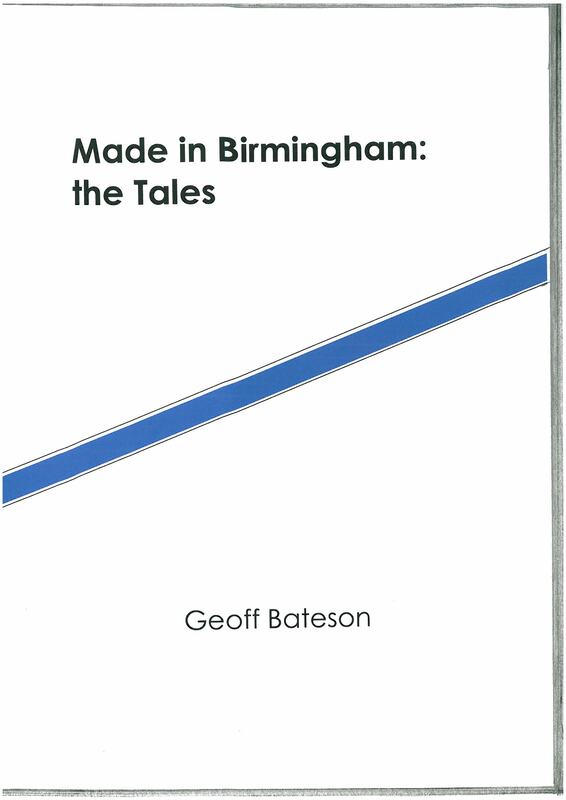 The full set is available as an e-book at the Amazon kindle site under the title ‘Made in Birmingham: The Tales’ by Geoff Bateson. As Birmingham?? ?s contribution to England?? ?s national Year of Reading a number of new poems were written especially to help promote reading to new readers. These were intended to be distributed as widely as possible to people in Birmingham and beyond. These writings were produced essentially for an adult audience, but have general appeal within that. These were written in deliberate attempts to cover a range of lengths and styles. Some are meant to be taken quite lightly; others are meant to be lingered over. A selection of the poems is offered here as a taster. 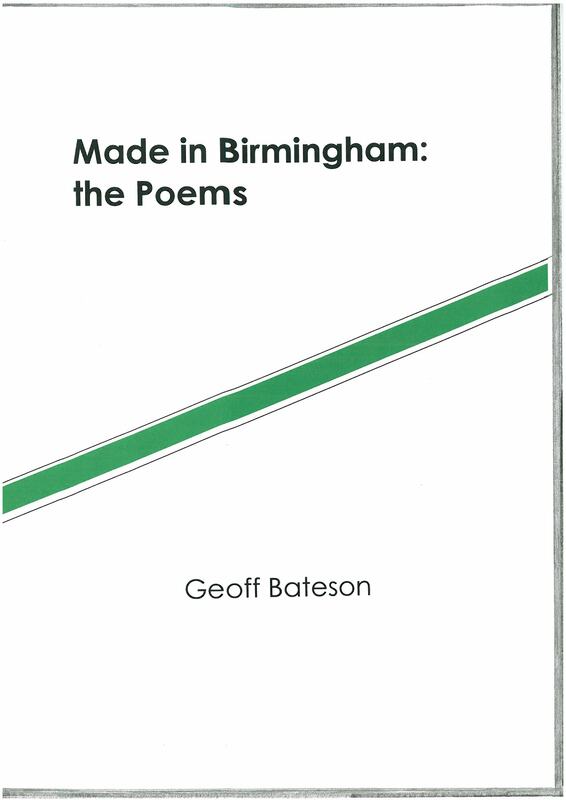 The full set is available as an e-book at the Amazon kindle site under ‘Made in Birmingham: The Poems’ by Geoff Bateson..
Castle Vale is a modern housing area on the north-eastern edge of Birmingham (UK). It is unique in many ways and has gone through distinct sets of changes. The things that most people noticed on their first visit to the area, when it was first built as a housing estate, was the flat and open landscape and the very distinct boundaries which seemed to almost cut Castle Vale off from the rest of the city to make a little island of people. These features have recently been changed, and will continue to change into the future, but each change is dictated by past developments. To understand what an area is like now, it is important to understand its history. The history of the Castle Vale area can be traced backwards, layer by layer and then built up again as a sequential record of those things that made the? ?place what it was at each stage of its development. The history? ?follows the changing fortunes of this one relatively? ?small area of land from its beginnings as a swampy forest, through the feudal times of battling barons, through the growing industrialisation of Birmingham to the First World War, on through its life as an airfield, finally to the construction of the modern housing estate and the very recent improvements to that area. From time to time little excursions? ?are taken into the wider history of the region but only in order to set the very local events within their wider setting and make them even more interesting than they already are.